Positive communication is the cornerstone of a healthy parent-child relationship. Even if toddlers can't articulate all that they feel, they excel are recognizing positive words from the negative ones. The way we phrase our words also has an impact on their behaviour in subtle ways. Toddlers rarely comply with something when they feel that they are being 'made' to do it. What works better are 'requests' and 'suggestions'. I feel that phrasing what you say to them positively helps keep them in a better and more cooperative frame of mind. You did that by yourself! Toddlers love being recognized for their individual efforts, no matter how small. By saying this phrase, you acknowledge their effort without over-praising. I personally don't set a limit on how much I praise my child, but I know there are parents who prefer being selective about what actions they praise. Either way, a toddler will love and feel good about a positive response for whatever steps they take towards independence. Encouraging toddlers to speak about their experiences, emotions, and thoughts is a good way to focus on the positive aspects. Talking is a great way to connect with your toddler, and making encouraging comments helps them open up and learn to think positively as well. It's not uncommon for every outing with a toddler to involve at least one episode of a meltdown. Even then, it is important to reinforce the good time they had, so they learn to put any upsetting thoughts behind them. This phrase reminds them of the good time they had, and how, as a parent, you are choosing to focus on that. We'll fix this/figure it out..
For toddlers, even little problems can seem insurmountable. Whether it's a favourite toy that's lost or the rain that's dampened their play, toddlers can get grumpy over anything! Saying something like this can show them that things can be fixed, or alternatives can be found. Parents can take the lead in demonstrating how problems can be solved with positive thoughts. This is a phrase I use often with my toddler, and I can see how much of a positive impact it has. When you recognize a kind act or helpful hand, it tells toddlers that being 'nice' is a good thing. 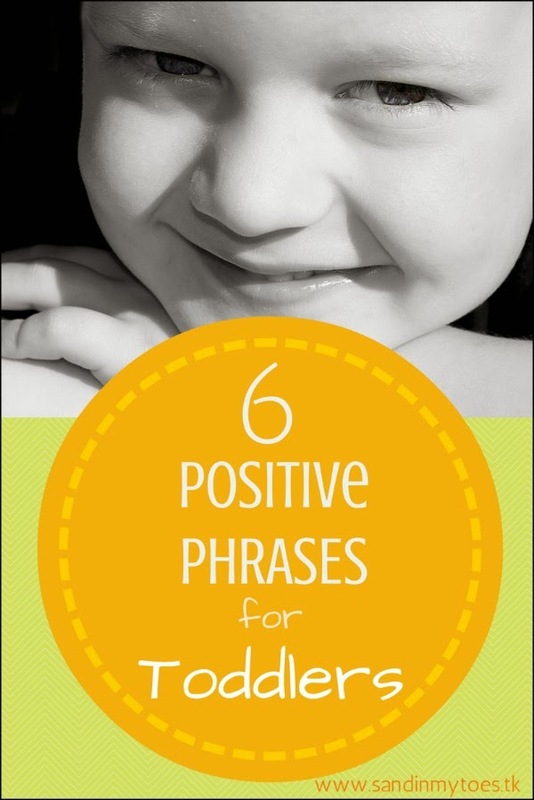 Toddlers thrive on positive phrases like these. Just remember to avoid doing the opposite, and reprimand actions that are 'bad'. Instead, it is better to point out what they could have done instead, and how that would have been a better thing to do. See my post on Four Words To Use Wisely Around Children. Above all, don't forget to say I love you! to your toddler as often as you can, supported by physical touches that reassure them. I mentioned the importance of a comforting touch in my post, Seven Tips For A Calmer Toddler. Also check out my post on Six Reassuring Phrases For Toddlers, in which I wrote about how you can help your toddler deal with situations that are mentally or emotionally challenging to them. You can also read my post on Six Kindness Acts for Toddlers, on making them compassionate human beings. It is true. Positive reinforcement always works with my son. That's true, which is why we need a reminder sometimes. I must check out that series, thanks! Praising our kids for good behavior is so so much more effective than only scolding them when it's undesired behavior! Great phrases, Tarana. Thanks, Chantelle! We do use these phrases naturally, but sometimes it's good to have a reminder. Hats off to you, Jenny, because you have two adorable and happy toddlers! Wonderful post! While I do use variations of these phrases daily, I really could stand to use them more. It's so easy to become overwhelmed and frustrated and let some negativity filter in! Thank you for sharing! Yes, it does work well! Not letting negativity get in the way is really the point. Thanks! I'm sure it will go down well with him then! We do need a reminder sometimes! Thank you! Yes, the tone of speaking can have a big impact on their behaviour. How sweet! They really do love being praised for putting in effort. Lovely ideas to incorporate with my says of teaching &reassuring my 3 year old. Thanks.